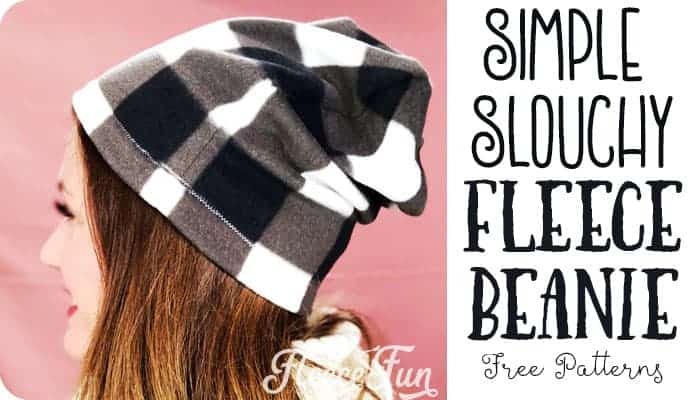 This free basic fleece hat pattern is the base for many of the hats on Fleece Fun. Master this and you’ll be able to make all the fun variations like the Dragon hat, bear hat, hat with horns or ribbon hat. 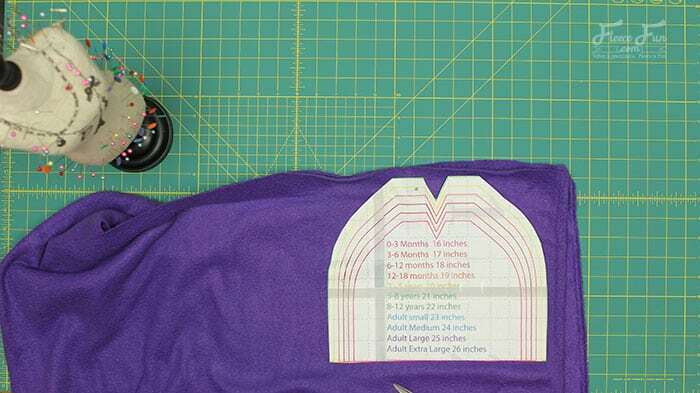 The measurements on the pattern are for the circumference of the head. So the measurement you would get if you too a measuring tape and wrapped in around a person’s head. Please note that fleece can have varying amounts of stretch to it. You will need to assemble the free pattern. For instructions on how to assemble the sewing pattern click here. 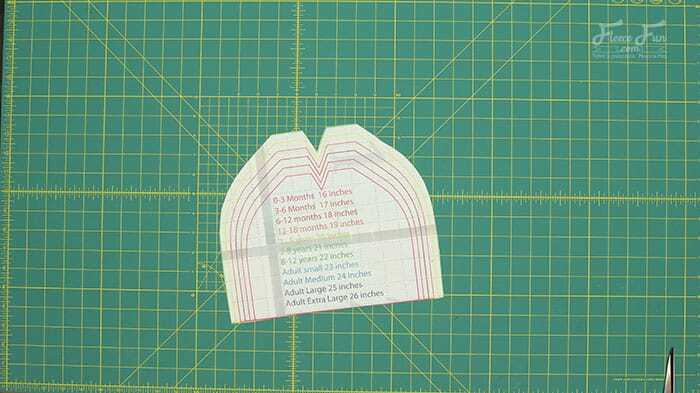 Decide on the size of hat you’re making and cut to that line. On folded cloth pin pattern and cut out. So you have two of the pattern pieces cut out. Pin right sides together. 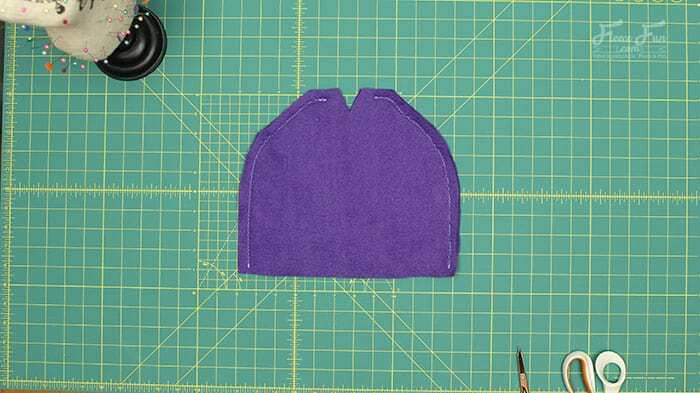 Using a 1/2 inch seam allowance sew each side of the hat (the long curved side to the point before it dips into a V. Be sure to leave the bottom (the brim) open. 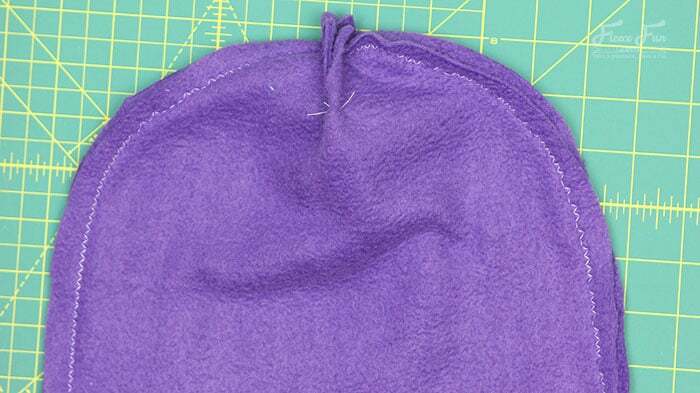 Tip – for a smoother hat, stop the seam a finger’s width before the “v”. 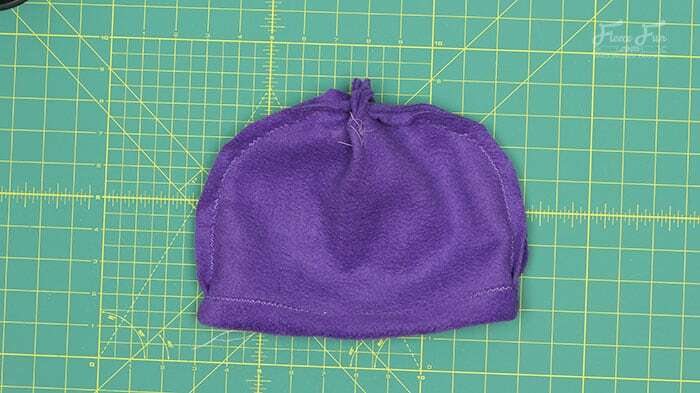 Turn the brim edge under 1 inch (or more/less if you like) pin and sew a zig-zag stitch over the edge of the fabric. Snip any loose threads and turn right side out. I would like to make the articles that can be downloaded because they are lovely as well as handy. However, I have come to a complete halt The scale of the paper it is printed on is not defined. As I live in South Africa naturally our measurements will differ from yours. I presume the Fleece Fun kits can be bought or ordered from selected stores in America only. This is where my problem comes in. How do I get the patterns to fit without the scale? I enjou your articles and products very much! I can see your frustration. In the US we use the imperial measurement system and the paper is 8.5 inches by 11 inches. However as long as you “print to scale” the scale should be maintained. I will be adding a test print page soon so you can check against that. Currently there aren’t any “Fleece Fun Kits” (although I would love it if there were!) so what is available on the website is all there is. 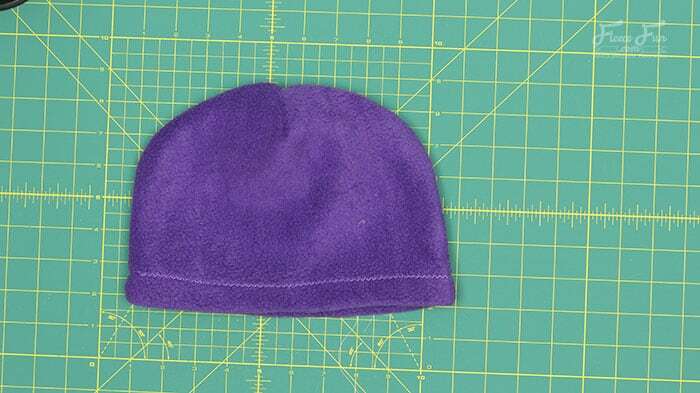 I’m making the fleece hats, and just realized that the pattern I printed from the pdf on the website came out a different size than the pdf I downloaded. 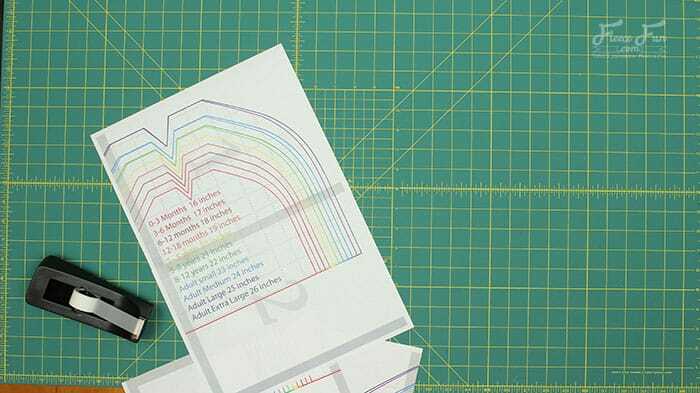 It would be really helpful to have measurements written on the patterns to make sure they’re printing correctly. 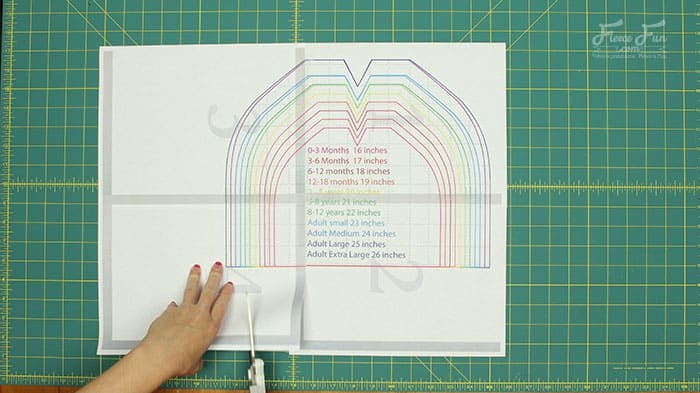 Can you tell me the width in inches of the bottom edge of each of the baby, child, and adult basic fleece hat patterns? Thank you for sharing this simple pattern. I am preparing to make a large quantity of fleece hats to send to impoverished children in Ethiopia through our church partnering with Compassion International and I disliked the look of the no-sew patterns I have found (as well as the fact that some of them leave slight holes/gaps which could let cold in). While I am able to sew something more complex, I was looking for a pattern which I could whip together rapidly and still be pleased with the outcome. 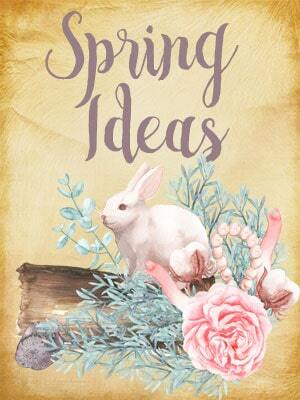 I believe I have found that here and am very excited to get sewing! I appreciate that you’ve shared your pattern for free, it is a blessing! Thank you Heather for generously donating your time to helping those in need! So happy my pattern can play a small part in that. 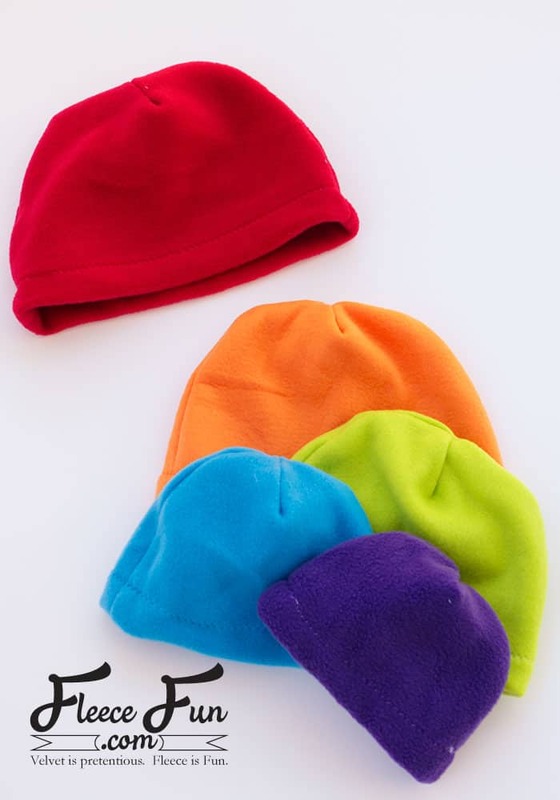 Hi, I just bought fleece to make some hats. Should I wash and dry the fabric before starting? 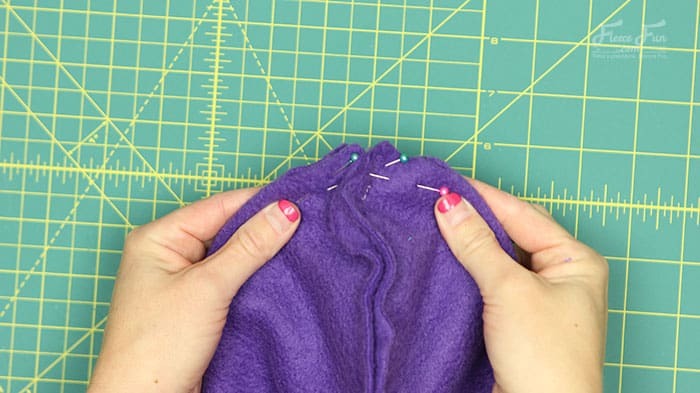 Fleece doesn’t shrink so you can just get started! No pre wash is necessary. I wanted to make some baby hats to donate to a children’s hospital. 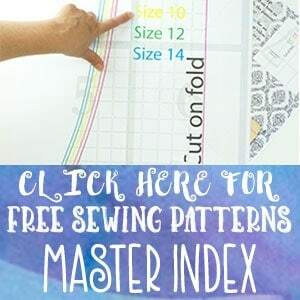 Your pattern looks easy to use (I do not have much sewing experience). But I am not able to access the pattern for the baby or child sizes. When I click on the adult pattern, I get to the pdf. When I click on the child or baby size, I am redirected to the home page. Can you fix this? I believe the issue has been fixed! I made two of these hats with my 14 year old nephew today. Will be great for our Canadian winter. He did all the sewing and was so pleased with the result. Thank you for sharing your great pattern with us. Where is the pattern with the ear flaps?